“Want a little art with your meal? New London’s newly refashioned Parade Plaza will host lunchtime performance previews – about 15 minutes – on Fridays from now through September. They do mean previews, all in advance of full-length shows coming up in New London. First up this week, for instance, is a preview of two events: the Traditions music festival at the Hygienic Art Park and the Sea Music Festival at Mystic Seaport. Then, on June 18, it’s Jazz Underground offering a sample of Kent Hewitt’s music. On June 25, the New London County Historical Society previews Vintage Base Ball and Connecticut Historic Gardens Day. For a complete calendar (which includes Flock theatre on Aug. 16, David Dorfman Dance on Sept. 10, and ECSO on Sept. 24), visit newlondonwaterfrontdistrict.org. Saturday, August 11, 2007, 11 am to 1:30 pm, Hopeville Pond State Park (CT). FREE admission to game, however, State Park parking fees in effect. Jay Rainier, a 17-year US Navy vet of submarine and surface vessels, currently stationed in Newport, RI, was sent for a tour of duty in Iraq. Although he’s a resident of Griswold, he plays left field for the Bristol Blues vintage base ball team in Bristol, Rhode Island. His wife Lora and his team have been planning his homecoming for months, and that event will feature a vintage base ball game at Hopeville Pond State Park in Griswold on 11 August, versus the Thames Base Ball Club of New London. Bristol captain, John Simmons, gave Jay a vintage base ball just before he left last fall. He was told that when he returns it should be put to use in a regular game. John intended the ball be a reminder that there is a normal life back here waiting for him – and that they needed the ball back! The ball and Jay made it back last week. The game is scheduled to begin at 11 AM on 11 August at the ball field at Hopeville Pond State Park and is open to the public. 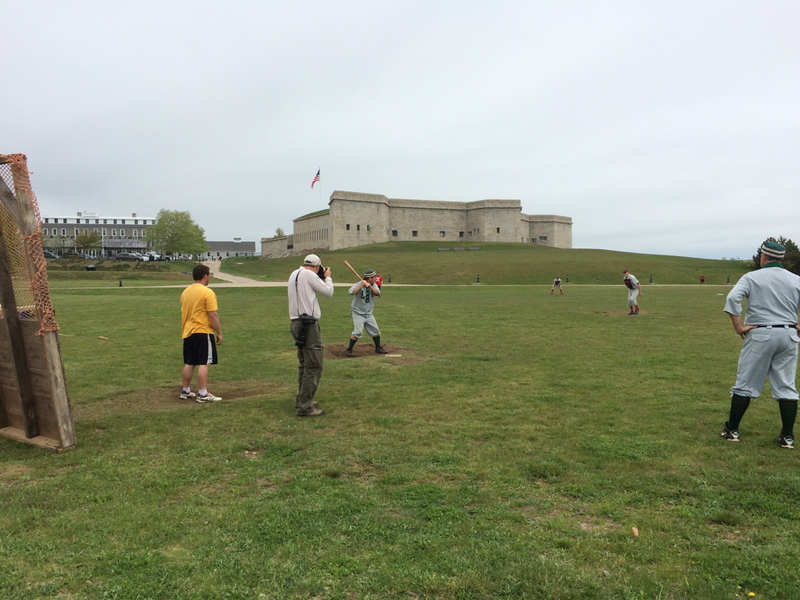 The Blues and the Thames Clubs play by the rules of 1861 as part of the New England Vintage Base Ball League. In 1861, gloves and catcher’s equipment hadn’t been invented yet, but neither had the concept of called strikes and walks. It was seen then as a healthful manner for gentlemen to get exercise, and the League attempts to maintain that historic character in the matches of today. The Thames Base Ball Club is a program of the New London County Historical Society and this is their first year in the League which began six years ago. Their record so far this year is 6 – 4 – 1 (tie called due to a time limit) playing teams from Waterbury, Bridgeport, Newtown and Columbia, Connecticut, and Essex and Lynn in Massachusetts. The Blues have the reputation as one of the League leaders and their record thus far stands at 4 and 2.